Originally published in 1883 by W. H. Beers & Company, this is a 2007 reprint by Heritage Books, Inc. Covers and inside pages are very nice and clean. Essentially as brand new. This is a 1976 reprint. 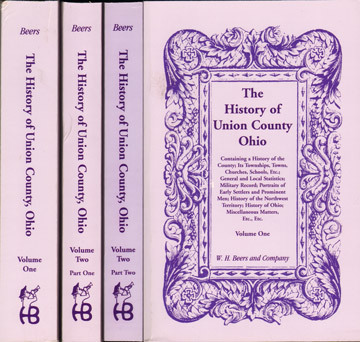 A detailed history of Union County, Ohio from first settlement and continuing to 1883. Also included are biographies of many individuals and families, great for genealogy research. The publishers list price is $92.00, our price is substantially less! Soft cover, three volumes with 1,256 pages with 156 pages of index for a grand total of 1,412 pages.